When moving house, some people prefer organizing everything themselves, while others opt for a professional assistance. If you are still wondering whether hiring professional movers would be a good idea, the following lines will reassure you and help you better understand the essentials of a moving process. – Knowing that professionals are handling your move will put your mind at ease. A reputable moving company will act according to the predefined schedule. Bare in mind that DIY moves usually take longer than planned, so by hiring professional movers you will save a lot of time, which is extremely important if you are facing an unexpected move. 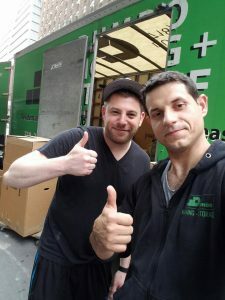 – Due to their great moving experience, NYC movers are competent to lead you through the relocation process and handle your belongings with the utmost care. – Also, oddly-shaped and heavy items are really difficult to handle without an appropriate equipment. Luckily, professional movers are fully equipped and qualified to help you with any kind of moving inconvenience. – Should any issue appear, it can be easily resolved if you have professional movers around. They know how to handle even unexpected situations that may arise during the relocation process. – Carrying heavy and cumbersome items can be very risky, therefore, you should leave this demanding task to the qualified moving company staff. They will make the process as simple as possible. – If your new place is not available for your items at the moment, but you need to leave your current place, full service movers usually provide storage services as well. You can rest assured that your items will be taken care of while you are having your new home renovated. – Full service moving companies offer various types of moving insurance, in case you want to purchase an additional one in order to provide the total coverage. That means that movers will be held responsible should anything happen to your goods and will compensate you according to the policy. – Most people happen to underestimate the importance of a proper packing material, which may result in further inconveniences and possible damage to their belongings. Nevertheless, it’s good to know that professional movers know exactly how to pack your belongings in a secure and efficient manner so that your goods are protected against breakage or denting. – In theory you can handle the whole moving process yourself, but it will require a lot of time, energy and money. Considering all the tasks, will you be able to complete everything on time and be ready for the moving day? Professional movers have mastered the best moving techniques so as to be able to keep your item safe. – Although your friends probably won’t refuse to help you, they won’t be thrilled about it either. No one fancies packing and heavy lifting. Save your friends a lot of hassle and invite them over for the housewarming party. Bare in mind also that a professional moving company is usually the most reliable assistance you can get.